I spent a lovely snow day in my bed stitching. Onyx kept me company for most of it. Lots of progress. This was Onyx when I woke up. Before she decided to join me on my bed. I started dance lessons again. Yay for having an income again! Not much done during the week. But here's the progress on Twilight Silhouette. First week of work wiped me out. I ended up doing some 'mindless' crochet because I knew I couldn't concentrate on much else. I was done by 9pm. 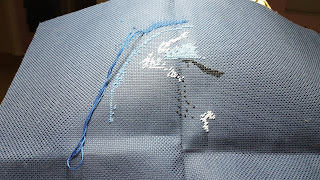 Started a new cross-stitch piece on the weekend. Twilight Silhouette. 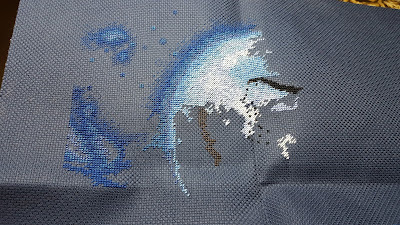 Almost all half cross-stitch but most is with 4 threads which makes pulling it through the fabric a bit hard..
2016 is so far starting out well for me. Got a full time job that became official on the first. What a lovely birthday present for me. Yay! Less crafting time, but I'll still work on things. 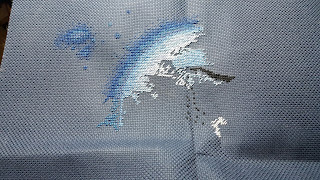 Onto the stitching. 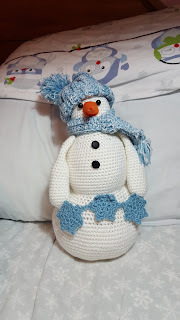 I finished up two projects that had sat partially completed for a while. I made the owl tissue box cover. I'll get around to the matching wall hanging and coasters later. And caught Onyx in a cute moment with her tongue out. Got this for my birthday which I had been eyeing for a while. Kind of told my parents to get it while it was at the lowest price I had ever seen it at. Also bought myself a birthday/congratulatory present as Herrschners had given me 15% off as a birthday present.